Blackhearts is an unstoppable story full of history, romance, and intrigue. This is Nicole Castroman’s debut novel and her writing style is genius. The story is told from the 3rd person limited POV. You go through the story seeing through both Teach’s and Anne’s perspectives. The 3rd person limited narration allows the reader to fully understand the context of the situation through the character’s eyes. When Anne is speaking, we only know how she is feeling and how she is interpreting Teach’s actions. The reader comes to understand how high society functions as well as the behind the curtain of the household staff. Anne is considered beneath the regular household staff due to her mother’s background (being from the West Indies). 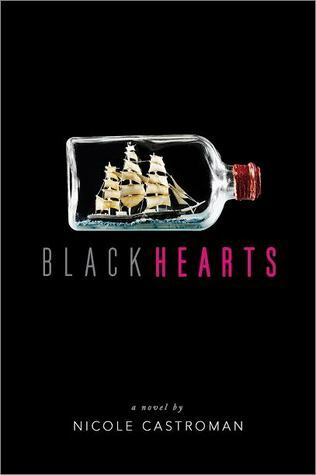 Castroman did an excellent job at conveying the misogynistic, sexist, and racist standards present during the time period Blackhearts is written. I didn’t have any preconceived notions about this book, but I will say reading others reviews of it helped me set my mind. When you hear “Blackbeard retelling”, you think pirates and ships. While Castroman didn’t give us those things in Blackhearts, she gave us a starting place, which I am grateful for. To understand Blackbeard you have to know where he comes from, and specifically, what made him into a pirate. The romance itself is a slow burn, building to greatness. You can feel the attraction between Teach and Anne from the first page. It also helps that there are other characters who get in their way. Miss Patience, the little priss teach is betrothed to (I wished she’d fall off a cliff. I am sure there are plenty in Bristol). Master Drummond, Anne’s employer and Teach’s father. I hope, if there is a second book (there better be), we come to understand why Master Drummond was so controlling, thinking he knew what was best for his son. I can’t believe that his character is just that controlling. And finally, THAT CLIFFHANGER ENDING! I stayed up super late to finish reading Blackhearts and it was totally worth it (I also had a terrible nights sleep, dreams filled with rats, cockroaches, ships, and seas). The slow burning love Teach and Anne have for each other reaches it’s climax and then everything explodes. My only thought at the end of the book was, if Anne hadn’t lied to Teach originally then none of this would be happening! If you like historical fiction, retellings, and romance, Blackhearts is the perfect combination.